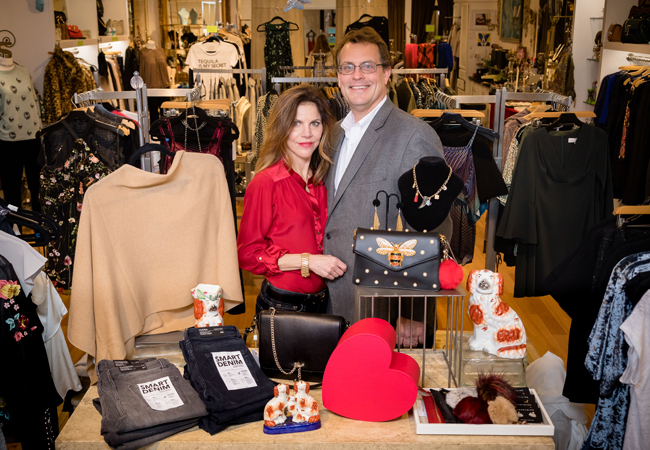 Lucie and Bert Stansbury opened Liv Boutique in 2015, and since that time it has become an absolute staple of St.Matthews and a destination point for style mavens. The shop is a contemporary women’s clothing, accessories, and gift boutique that evolved from Lucie and Bert’s sister business called the Century Shop, a wondrous antiques store with a selection of gift and estate jewelry. Lucie’s background in design and marketing, as well as her passion for fashion coupled with Bert’s strengths in details and numbers made the couple feel like they could take the leap of faith and give her dream a go. The two understand that in this day and age, a brick and mortar retail shop might seem like a bit of a risk. However, Liv is a special place, and offers all the amenities of online shopping, along with so much more! Stepping into Liv you will find a relaxed vibe, almost like visiting the home of a friend. There’s engaging conversation, a sweet little dog or two, snacks, and of course all the amazing stuff to purchase! They carry fresh accessories and apparel lines, all upscale yet affordable. Look for quirky decor, and antique or vintage gift items and estate jewelry as part of the mix. The knowledgeable team at Liv is eager to work with the client to personalize and customize their visit, to the level that they desire. Liv offers services such as personal styling, home deliveries, private shopping parties, color consultation and mineral make up. If there is a service the client desires, the team will make it happen! Stop by Liv in the heart of St Matthews at 3704 Lexington Road.